When you start to consider how to best invest in your company's online presence, you should consider the 10 things you should know before you invest in SEO. There are many hundreds of facets of optimizing a site properly, and there are a few things that you should know before you start discussing the possibility of a new site. Below is an example of a mistake we still see pretty often - a beautiful site design that has no SEO friendly content, so it may never actually have new customers coming to it. We can show you which technologies can help grow your business. Every company is different, and what works for one small or medium sized business will not work for the next. Google Search is the most widely used search engine on the world wide web. What does that mean for you exactly? Well, the majority of all Web traffic is driven by search engines. Google, which receives several hundred million searches each day, drives more than 60% of all Web searches. But the question is, do you need Search Engine Optimization for your site? To answer that, we need to know, how do you plan on marketing your Web site? Unless you engage in a method of online advertising ' whether that is organic SEO, social media, pay-per-click advertising, e-mail marketing, a banner campaign, or something else ' marketing your Website is the most reliable way to ensure that you receive ROI. There is an answer specifically for you. While the ultimate recommendation is to always have your site be optimized to the best level, you have to approach everything from what your business, your demographic, and your budget, call for. Marketing a site across all platforms isn't always logical for every business model. SEO is not only a science - there is an art to weaving appropriate SEO for each business. From selecting the most effective keywords to analyzing the best way to market for your demographic, the best way to achieve a good ROI through your Website is to approach it like the rest of your business, from an educated standpoint where you make informed decisions. When you don't ask people to come in, they don't come in. Seems like a fairly simple concept, that when you ask people to come into your business, they do. The same concept works on the Web. Advertising and marketing for your online storefront follows the same basic principles. You have to spend a little money to advertise for that store. 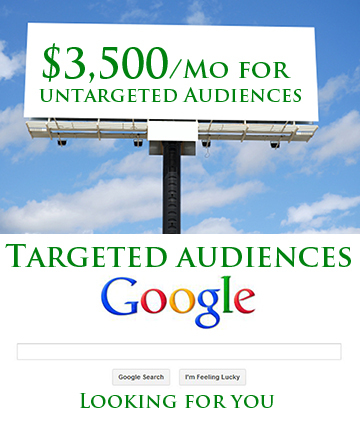 With average monthly costs for a billboard between $1,500 and $30,000, you have to wonder, "What kind of audience am I reaching for that money?" We're not suggesting, for even a moment, that billboard advertising doesn't work. Hundreds of thousands of eyes may pass over a billboard for your business, depending on your placement, every day. That's why it costs as much as it does; because with brute force, you may attain some calls, and eventually, some customers. 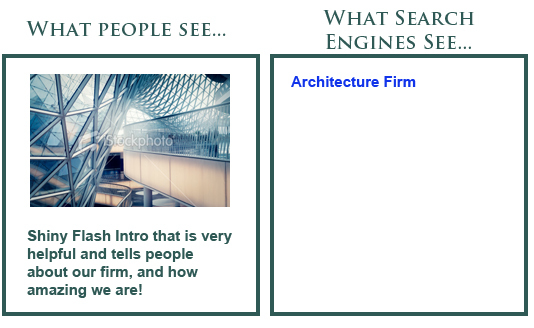 SEO approaches advertising from a more targeted approach. Millions of people search for products, services, and information every day. 65% (66.2% in 2012) complete those searches on Google. With Google, Yahoo, and Bing, more than 90% of the market share of searches are perfomed. But of that 90% of the millions of searches, 90% of the clicks that are followed are on the first page of results. The key is figuring out which keywords people would be searching that you want to come up for. A carpenter may consider "carpenter," "general contractor," or even "kitchen remodeling," whereas a law firm may want, "personal injury attorney" as well as "car accident lawyer." The idea is to get into the head of your customer, and then to optimize your site appropriately to be found for the keywords that people will need you for. You and your employees are our subject matter experts. We know how to think like an audience, we know the SEO techniques to get you to rank for the keywords that make the most sense. But blending your expertise in your industry with our expertise in SEO is the key to a successful online campaign. To learn more about how our St. Louis SEO services and website design can help your business grow into the new millenium, please contact our St. Louis SEO company.